Key difference: An actor is a person that acts. Acting is essentially the portrayal of another person or character. An actor basically acts in a dramatic or comic production, whether it be in film, television, theatre, or radio. An artist, on the other hand, is a much broader concept. An artist is a person who is involved in any activity as categorized under the arts, such as creating art, practicing the arts, and/or demonstrating an art. An actor is a person that acts. Acting is essentially the portrayal of another person or character. An actor basically acts in a dramatic or comic production, whether it be in film, television, theatre, or radio. A person who acts in stage plays, motion pictures, television broadcasts, etc. A person who does something; participant. It is believed that one of the first actors of the western world was Thespis of Icaria in Ancient Greece. As the story goes, Thespis walked out of the chorus line and spoke to the audience as the character or Dionysus. Before that the chorus used to narrate the play, including the dialogues, for example: Dionysus went there… Dionysus said … It was the actors’ job to move around on stage and behave as the chorus dictated. However, Thespis broke that norm and spoke directly to the audience as Dionysus. I am Dionysus. I went there… I said… Of course, that is not how modern actors act; they just do or say, rather than narrate what is happening. 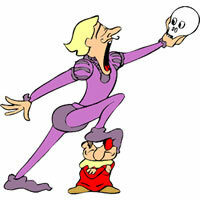 However, Thespis set the stage for modern actors. Acting requires a wide range of skills, including vocal projection, clarity of speech, physical expressivity, emotional facility, a well-developed imagination, and the ability to interpret drama. At times, actors may also be called upon to employ dialects, accents and body language, improvisation, observation and emulation, mime, and stage combat. In order to develop these skills, many actors train in special programs or colleges. An artist, on the other hand, is a much broader concept. 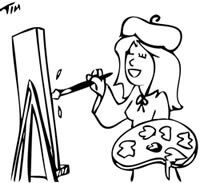 An artist is a person who is involved in any activity as categorized under the arts, such as creating art, practicing the arts, and/or demonstrating an art. A person who practices one of the fine arts, especially a painter or sculptor. A person who works in one of the performing arts, as an actor, musician, or singer; a public performer: a mime artist; an artist of the dance. Essentially, an artist is anyone who is related to or engages in the arts, whether it be the performing art, the fine arts, etc. It may even be used to refer to someone who takes an artful approach to his or her work. Hence, an artist may be an actor, a singer, a musician, a dancer, a photographer, a writer, a filmmaker, a painter, a sculptor, etc. It may even be a carpenter who creates beautiful pieces out of wood, a clockmaker who makes beautiful clocks, a potter, a goldsmith, a glassblower, etc. An artist must have and use imagination, talent, and skill to be effective in their arts. Hence, an artist is anyone with these traits and who regularly employs than in their particular field.